Este señor de India quiere entrar al libro de los records metiendo una cobra viva por su nariz y sacándola por su boca. En la foto, C Manoharan Snake Manu practíca con una serpiente de jardín y planea hacer lo mismo con una cobra para crear un nuevo Record Guinness en Mandras, India. Es una buena manera de celebrar el 50 aniversario del famoso Libro de los Records. An Indian man is aiming to get into the record books by running a live cobra through his nose and out of his mouth. 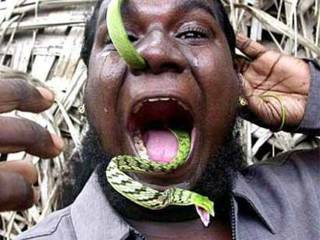 C Manoharan Snake Manu runs a garden snake through his nose and out his mouth. He plans to do the same with a cobra to create a Guinness Record in Madras, India. A nice way to celebrate the 50th anniversary of the Guinness World Records. C Manoharan Snake Manu has been practising the stunt with a harmless garden snake at his home in Madras, and he is the living proof that not only in the so-called 1st World there’s people doing stupid things.